UPS is the latest big-name company to order Tesla's new semi truck. Tesla's (TSLA - Get Report) electric semi truck had been shrouded in mystery before its debut last month. Since then it has received preorders from more than a dozen companies even though the vehicle won't begin production until 2019. It currently costs $5,000 per truck for a reservation. The truck will have a price range between $150,000 and $180,000. Here are six high profile companies who have made public announcements about purchasing the sleek vehicles. United Parcel Service, Inc. (UPS - Get Report) , which operates one of the largest commercial trucking fleets in the world, today announced it has placed a reservation for 125 of Tesla Inc.'s (TSLA - Get Report) new fully-electric Semi tractors. The new tractors will join UPS's extensive alternative fuel and advanced technology vehicle fleet, comprised of trucks and tractors propelled by electricity, natural gas, propane and other non-traditional fuels. Pepsi announced its order Tuesday, the largest such order to be made public so far. 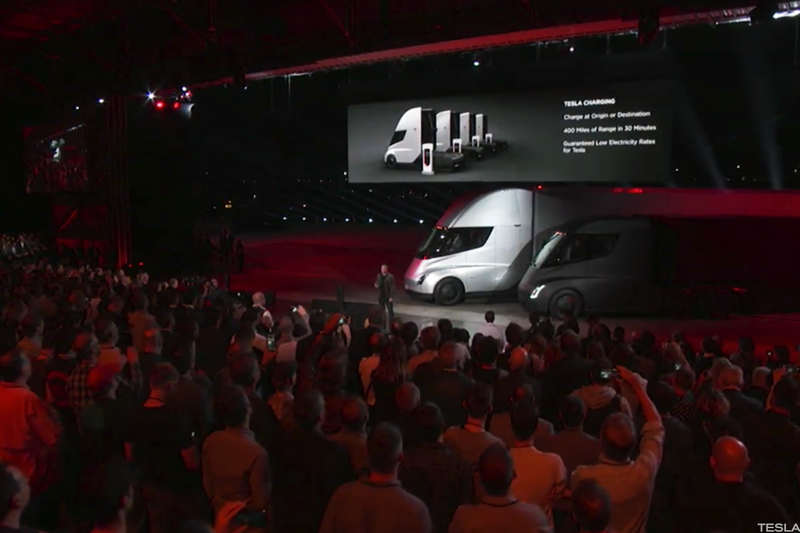 The Tesla trucks will complement the company's already 10,000 strong trucking fleet. The plan is for Pepsi to reduce greenhouse gas emissions across its supply chain 20% by 2030. Food wholesaler Sysco (SYY - Get Report) placed an order for 50 Tesla semis over the weekend. Currently, Sysco employs about 7,500 trucks to make deliveries to 425,000 customers. "We are excited to begin the process of incorporating alternative-fuel trucks into our fleet," Sysco COO Tom Bené said. "In addition to the positive environmental impacts, we will also benefit from reduced fuel and maintenance costs and drive associate enthusiasm with the introduction of new and unique technology." Budweiser parent company Anheuser Busch (BUD announced a reservation for 40 trucks last week. The beer maker hopes to lower fuel costs and vehicle emissions by 2025. The company said the fleet will help it reduce its operational carbon footprint by 30%. Transporter J.B. Hunt (JBHT - Get Report) announced multiple bookings of the Tesla truck shortly after its debut in November, saying that it intends to utilize the vehicles' Dedicated Contact Service and Intermodal segments for its West Coast operations. "Reserving Tesla trucks marks an important step in our efforts to implement industry-changing technology. We believe electric trucks will be most beneficial on local and dray routes, and we look forward to utilizing this new, sustainable technology." Shortly after the debut of the truck, Walmart (WMT - Get Report) announced an order for 15 trucks as part of a pilot test program in North America. "We can learn how this technology performs within our supply chain, as well as how it could help us meet some of our long-term sustainability goals, such as lowering emissions." the company said.